All inbound lanes on the Eisenhower Expressway were shut down near Kedzie Avenue Monday afternoon for a shooting investigation, authorities said. Trina Orlando reports. All inbound lanes on the Eisenhower Expressway were shut down near Kedzie Avenue Monday afternoon for a shooting investigation, authorities said. 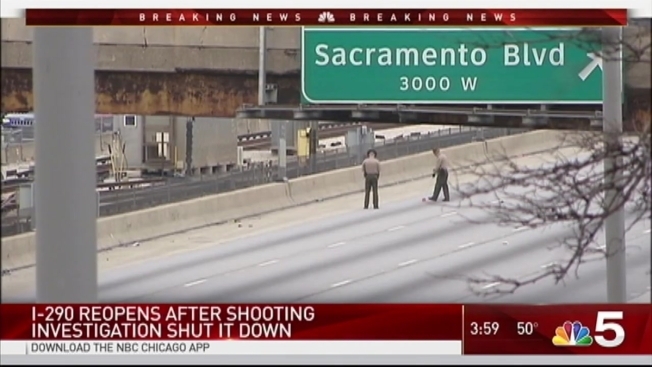 Illinois State Police said it was not immediately clear what happened but a witness saw two vehicles traveling eastbound shooting at each other on the expressway near Kedzie. One shell casing was found at the scene, according to authorities. There had been no victims reported Monday afternoon, however. Traffic was being diverted off the eastbound lanes of the roadway at Independence Boulevard shortly after 1:30 p.m. The incident remained under investigation as of 2:45 p.m. but the roadway had reopened just before the afternoon rush hour.